One hundred sixty people left the ice today. Kind of sad to see more friends go, but kind of exciting to see who will be the last people standing for winter. I'm run myself ragged saying goodbye to people so I need to get some rest. I think I might have what we call the crud. I think it is just the common cold. A thought I had today while writing Lindsay Paige was if it is a cold, why call it the crud? Why is a cold called such? I don't feel cold when I have it. However, I do feel cruddy so perhaps the crud is a better name. This won't be the volcano blog yet. I'm too tired and a little sick and I'll need more energy to put that one together. I'm just going to post some random pictures from the season. 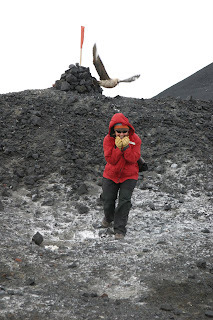 A picture of me at the McMurdo Geography bee. I got 3rd. Do not try to plug this in. 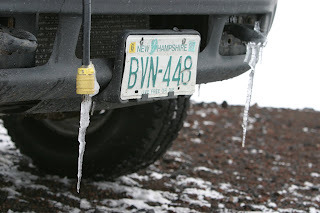 Of course, the license plate says 'Live Free or Die' so maybe you shouldn't listen to what I say. Our second trip was to check on baby skua. 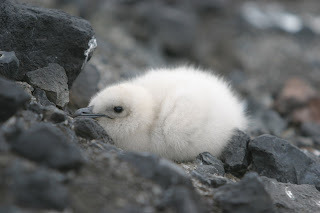 The cool think about baby skua is that it is well camouflaged. If you didn't know it, you could almost walk right on top of it which is unfortunately what Jami almost did. The skua parents weren't happy. Run farther because momma skua still has a point to make. After Jami did such a great job finding baby skua, I took one last picture before we headed on our way. We had accidentally disturbed them enough. I blame the skua for nesting so close to the hiking trail, but maybe we didn't mark it well enough for birds to recognize it. Of course, given how much food they seem to poach us for maybe they did it on purpose. Jami, "Is there someone else up there we can talk to?" 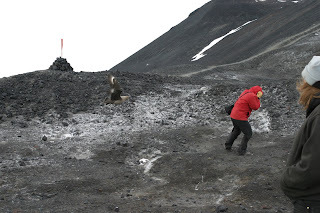 Skua, "No, now go away or I shall taunt you a second time." Brody, the common cold is called a "cold" because it was once believed that cold weather caused this disease. However, research has shown that the common cold is caused by a virus (rhinovirus, I believe). Viruses are unaffected by cold weather, as they are simply carriers of genetic code. The cold is probably more prevalent in the winter season because more people are indoors and heaters are blowing germs around. I think the name "The Crud" is actually much more fitting. Happy belated Valentine's Day, Brody.